Professor Fizzy’s website just got a major reboot! 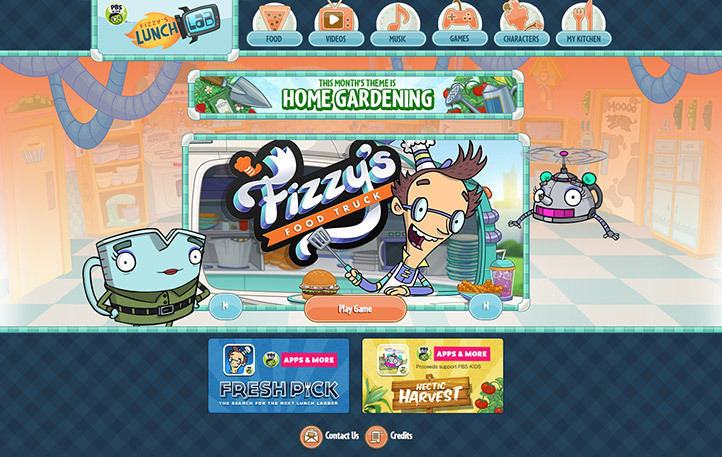 When PBS Kids first launched Fizzy’s Lunch Lab in 2009, Flash was still widely used, and it enabled us to include animation-rich menus and an engaging character presence. But with more and more kids, parents and teachers trying to access the Lunch Lab content from phones and tablets, it was high time to ditch Flash for HTML5. Redesigned to accommodate a range of screens, the new responsive Lunch Lab site ensures that everyone can access the videos, songs, recipes as well as current and future mobile web games at home and on the go. We’re also incredibly excited to announce the very first Lunch Lab HTML5 web game. With the food truck craze that’s sweeping the nation, how could Fizzy not be part of the action? In Fizzy’s Food Truck, kids are challenged to use systems thinking to juggle a myriad of tasks. Whether they’re making sure the black bean burgers don’t burn, that customers get exactly what they order or that Fast Food Freddy doesn’t lure customers away, players need to keep Fizzy’s customers happy. We’re still trying to push the boundaries of HTML5 and Fizzy’s Food Truck is another step toward creating more complicated games with fantastic animation and audio. So hop on your mobile phones and tablets to check out the new site and be sure to sling some burgers in the addictive game (don’t say we didn’t warn you!). We are excited to introduce the OZMAT Creature Tumblr! Now that OZMAT has officially rolled out, we wanted to highlight all of the awesome creature-related content in one place. Animated creature tests? Got ‘em. Top secret dossier files and photos? You betcha! Unreleased animated GIFs? Bonus! We’ll be rolling out all of this content on the Tumblr over the next few weeks, so be sure to share, follow, and reblog with your peeps. Big news from our block in Brighton! A while back, we collaborated with our friends and neighbors down the street at WGBH on converting some Peep and the Big Wide World Flash games to mobile apps. We were excited to help them bring this content to a new generation of users and were so happy to hear the news today that five of the apps we ported have been honored with Parents’ Choice Awards. Check out the reviews, and the apps if you have a chance! As a follow-up to our post a couple weeks ago, we’re super excited to announce that we’ve begun production on a second original pilot for Nick Digital! We’re honored to be working with one of the biggest leaders in kids’ entertainment on these pilots, and are particularly proud to be collaborating with such an innovative group within Nickelodeon. Part of our excitement is also due to the fact that our two properties are really different from one another: one is focussed on world and story building, and the other is pure ridiculous, physical humor. We can’t wait to share both pilots with you all later this summer! Moving episodic content off of the TV and into new formats is not a new idea; online streaming, DVDs and DVRs have undeniably changed how and when we watch shows. The real potential for innovation, though, lies in much more than the ability to watch the same content on a different platform… it’s about no longer being beholden to television, and its current monetization structure, in the first place. With the successful launch of Netflix’s original, House of Cards, and the highly-anticipated release of cult-classic (and TV cancelled) Arrested Development, it’s clear that there is a market for original content to thrive off of the TV set. Children’s content is a natural component of this potential, as kids, perhaps more than any other demographic, clamor to watch and rewatch their favorites (and many parents would be willing to pay for subscription services to ensure their ability to do so). With Amazon Studios actively developing 5 pilots with key players in the children’s media space, and Netflix announcing a new original series to be created in partnership with DreamWorks, it’s clear that some key players have seen the potential, and are investing heavily in it. And last week’s Kidscreen made it clear to us and fellow attendees that other major companies (Hulu, Google) will also be throwing their hat in the ring for what promises to be the next wave of children’s original content. Our biggest concern, and excitement, in all of this potential is to see whether or not this new, “original” content will actually be all that original. We strongly believe that web content has the potential to be so much more than 11, 22 or 45 minute instances of passive consumption of video content. With the new distributors relying on more of a subscription-based model for monetization (vs. ad money and international sales), the time to take risks, and give viewers fresh, ground-breaking content is now. We think there’s a ton of potential here for the power to shift into the relationship between content creators and viewers (as evidenced by Amazon’s asking for public opinion on which pilots to pick up for series). We hope the masses push for more innovative, unique formats that creators will love to make, and viewers will excitedly pay for. Who knows… traditional broadcasters may even be forced to follow suit if new stakeholders push the envelope for what viewers expect from innovative, cross-platform content. Only time will tell if we’re going to continue to see more of a TV 2.0 on the web, or something truly “original”. Here’s hoping it’s the latter! It feels like just yesterday that we were dreaming up Negative Nimbus in our first company game jam. We’ve come a long way since that day last August, and we are so unbelievably proud to announce Nimbus’ app store debut. Nimbus and the rest of the Sunnyland gang launched on iPad today, and we will be releasing the game on iPhone and Android later this year. We’ve also released a new gameplay trailer that showcases the app in action. This game has been a true labor of love for all of us at CloudKid HQ, and we are so excited to finally share it with all of you. Please check it out, and help spread the word to your own networks! For months now, we’ve been hinting at the release of our first original iOS app. Well, good news loyal CK followers… the wait is almost over! Negative Nimbus, our lovable little rain cloud, along with his fellow Sunnyland inhabitants, will be coming to an iPad/iPhone near you very soon. In the meantime, Nimbus’, website, blog and trailer (also above) have all gone live. Check these out for lots of sneak peeks and behind-the-scenes looks at the production and development of the app. While you’re at it, please like Nimbus’ Facebook page. We’ll be posting all kinds of exciting updates there leading up to launch, and little Nimbus can use all the love he can get! We’ve been super busy at CloudKid HQ since we last posted about prepping for BostonFest. Good news: the event was a huge success! It was really exciting to talk with tons of fellow Bostonians about CloudKid and to share a couple of our games (Snacker Stacker and Hectic Harvest) with new audiences. We also shared an exclusive preview of our upcoming original iPad app, Negative Nimbus. We were so excited that the crowd loved the game’s trailer as well as the character and background designs. So many folks told us they couldn’t wait to play the app, and Nimbus buttons were the quickest CloudKid schwag items to go. We can’t wait to share more of this game in the upcoming weeks, including at our next local event: the Boston Festival of Indie Games. In the meantime, check out the photos from BostonFest in our Facebook Album.